There is a quality in Dutch art I have noticed in different painters, different epochs and different styles. I am going to call it “yearning”, but that doesn’t quite summarise it. It’s a disappointment with the present that causes you to dream of other places: a tugging desire to be somewhere else. Rembrandt had it, and Van Gogh. Vermeer had it, and even Mondrian. Something cold and strict about the Dutch living experience created an appetite for warmth and colour. Another artist who exhibited these typical Dutch symptoms in spades was Sir Lawrence Alma-Tadema (1836-1912), famed depicter of ancient Rome and the subject of a rousing investigation currently being mounted in the entirely appropriate venue of Leighton House. Some will be surprised to learn that Alma-Tadema was Dutch. He appears to fit so snugly into the story of Victorian art. Knighted in 1899, he was the richest and most successful artist of his epoch, a Royal Academician, a winner of numerous gold medals, a much-praised, much-collected supplier of exotic flights of fancy to the rich and the privileged. That is what he became. But it is not how he began. He was actually born in a town called Dronrijp, situated in that especially wet and especially dank province of Holland known as Friesland. If you want to understand what Friesland feels like, Google “Van Gogh’s views of Drenthe”. The scenes that will pop up were the bleakest Vincent ever painted. And Drenthe is southeast of Friesland! Further north, in the flat lands of Alma-Tadema’s birth, the tepid light of the North Sea turns reds and yellows to grey. No wonder Friesian cows are Friesian cows. Alma-Tadema grew up in a black-and-white world that never switches to colour. We encounter him in the show when he is 14 or 15, and already painting portraits of his family and its circle that are startlingly accomplished. The face of Frederika Reijnders, a teenage friend of his sister, is a little flabby, but the glass of water by her side and the raspberry-striped carnation next to it are astonishing passages of painting. I was still marvelling at their creator’s precocity when up loomed a portrait of a boy with podgy cheeks who looked about 11. It was actually a self-portrait, painted when he was 16. The baby face and the mountain of talent feel like an impossible match. But the next stage of the show does indeed have a schoolboy flavour to it. At 16, he left home and spent four years at the Royal Academy of Antwerp, churning out melodramatic incidents from the action-packed history of the Merovingians. It’s the exhibition’s low point. 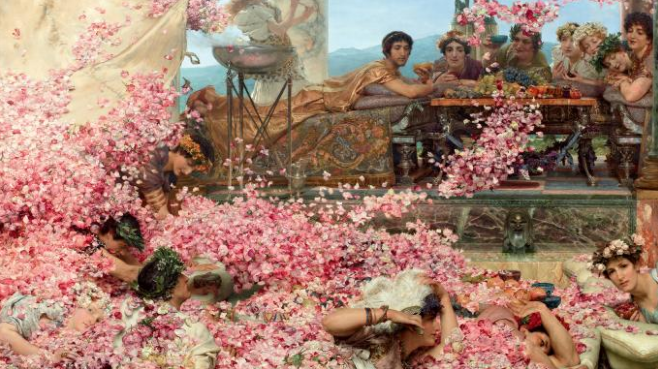 Not because Alma-Tadema’s precocious skill at evoking the textures and fabrics of the Dark Ages diminishes — it doesn’t — but because the Game of Thrones atmospheres he strives for feel so hammy. A schoolboy is painting subjects that are beyond his emotional range. Had he remained in Belgium, producing cod medieval tales of damsels and tyrants, I doubt we would be hearing much of him now. Fortunately, a real-life damsel intervened to save him. In 1863, he married Marie-Pauline Gressin, and the two of them spent their honeymoon in Italy, where the love, the light and the history lifted his art onto another plane. It’s like someone opening a window. Suddenly, the gloomy fakery of his Merovingian phase is banished and we find ourselves in a fresh and bright reimagining of ancient Rome. The picture that marks the change is an interior of the church of San Clemente, filled with so much astonishing detail that I found myself enjoying it for 30 minutes. San Clemente, in Rome, is famed for its Byzantine mosaics, its reclaimed classical columns and its cosmatesque floor made of countless fragments of multicoloured marble. It’s a glorious historical hotchpotch of an interior that Alma-Tadema manages somehow to unify in a bravura display of atmosphere-capturing. The small figure of a woman disappearing behind one of the columns is Pauline, whose presence adds a note of mystery to the scene, but also an emotional charge. This emotional charge is the big discovery for me at this event. However far from the everyday Alma-Tadema takes us in the grand Roman imaginings that follow, he seems always to be recording something authentic in his own feelings. The paintings are set in ancient Rome, but the moods are set in him. The light of Italy, the colour of its ancient marbles, the warmth of its sun, have triggered that Dutch sense of yearning. In particular, a honeymoon visit to the ruins of Pompeii affected him profoundly. For Alma-Tadema, the destruction of Pompeii was a historical calamity that seems to have personal resonances. His predecessors in Dutch art painted bouquets of beautiful tulips to make the point that life is brief and earthly pleasures are temporary. For similar reasons, Alma-Tadema sets his astonishingly accurate depictions of the classical world in a Pompeii that is doomed. A beautiful woman smells a flower. A thoughtful man reads a book. But as both of them are ancient Pompeiians, their enjoyment is fated to be brief. This feeling that you are in the presence of a painter who paints from the heart is especially difficult to miss in his portraits of his family. For all his success, Alma-Tadema had a life dotted with tragedy. His father died when he was very young. Pauline died a few years into their marriage, at just 32. The two daughters they had together bob up warmly in the show as subjects, but also as practitioners, because he taught them to paint, and taught them well. In 1870, the yearnings brought him to England, where he anglicised his name from Lourens Alma Tadema and found Laura, his second wife, who makes frequent appearances in the reincarnated Pompeii and who also became a painter of note under his tutelage. This powerful sense of family life is another of the show’s surprises. It is evident also in the depictions of the London houses Laura and Lawrence created together. A home bod by instinct, Alma-Tadema sets increasingly detailed descriptions of life in ancient Pompeii in his own studio. Like Jean des Esseintes, the hero of Huysman’s great symbolist novel A rebours, written at exactly the same time, he voyages adventurously in the comfort of his own home. A particularly important corrective made by this excellent event is the different understanding it brings to Alma-Tadema’s depictions of young women. There are lots of them. A typical painting of his Royal Academy years might show two Pompeiian girls on a marble bench staring dreamily out to sea while a distant galleon sets sail below them. Having previously suspected such imagery of sly eroticism, I now recognise them as family pictures: a worried father’s ruminations upon the fate of his offspring. Vermeer did the same thing when he painted his beloved daughters standing by a window, reading a letter or playing the virginal. A home bod is turning something domestic into something universal.